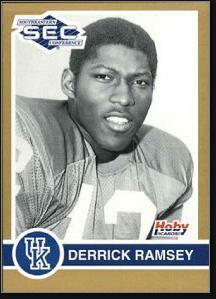 Derrick Kent Ramsey was born December 23, 1956 in Hastings Florida. Eighteen years later, he would lead the Camden, NJ football team to a state title. Derrick’s father, Rudy, had been a hometown football hero in Hastings. His sons—Derrick included—were known as Rudy’s Boys. Each became a standout for the Hastings High gridiron squad. At the age of 9, Derrick saved up enough to buy a book on great NFL quarterbacks. He read and reread the book with an eye on becoming a top quarterback himself. Derrick was part of a state championship team as a freshman and sophomore, and demonstrated the potential to become an impact quarterback at the Division-I level. Integration was only beginning to come to southern colleges at the time, which meant recruiters were not likely to see Derrick in action. In order to increase his exposure, Derrick moved to Camden to live with his uncle. He became the quarterback at Camden High in 1973 as the team struggled through a two-win season. However, in 1974, the Panthers rolled to a state title with Derrick at the helm. At 6’5”, Derrick had the ability to see the entire field, and also had great foot speed. He was recruited by several schools, and ultimately chose to follow teammate Art Still to Kentucky. Derrick also played two games for the basketball team while in Lexington. The Wildcats struggled through a losing season in 1975, losing one close game after another. This provided an opportunity for Derrick to earn a start, becoming the school’s first African-American quarterback. In 1976, Derrick helped the team turn things around. He led the Wildcats to a stunning October victory over Penn State, a Top 10 team, as well as wins over LSU and Florida—all national powerhouses that year. Kentucky beat UNC in the Peach Bowl 21–0 with Rod Stewart scoring all three touchdowns. The 1977 team went 10–1 and was undefeated in SEC play. One of the Wildcats’ most inspiring wins came over Tennessee in the season’s final game. Derrick was on the bench with an injury to his right arm, but came into the game in the 4th quarter with Kentucky down 17–14. He led the team to a touchdown and a 21–17 lead, but the Vols came charging back. With the ball on Kentucky’s 22 yard line, Art Still blew up quarterback Jimmy Streater, causing a fumble recovered by Kentucky to seal the win. The Wildcats finished the year with a #6 AP ranking. After the season, he was named Fist-Team All-SEC and was honored as the Outstanding Quarterback in the conference by the Birmingham Quarterback Club. Derrick made himself available in the 1978 NFL Draft and was taken by the Raiders in the 5th round. Although he had thrown 14 TD passes, Al Davis and John Madden were more interested in his 25 rushing touchdowns and envisioned him as a tight end in the pros. He saw action on special teams and as a blocker, backing up All-Pro Dave Casper during his first two seasons. In 1980, he earned a Super Bowl ring as a sub. Finally, Derrick became the team’s starter in 1981, hauling in 52 passes. 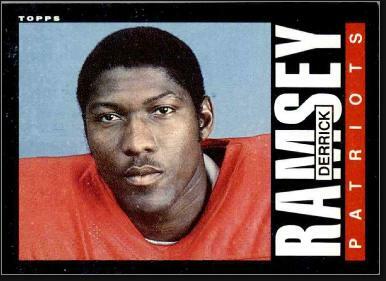 In 1983, Derrick was traded to the Patriots. He caught a career-high 66 passes in 1984 and 28 more splitting time with Lin Dawson in 1985. That year, Derrick reached the Super Bowl for the second time. But the Patriots were wiped out by the Chicago Bears. Derrick caught two passes for 16 yards, but also fumbled in the big game. Derrick retired from pro football following the 1987 season, during which he appeared in one game for the Lions. He went back to school and earned his degree, and became Athletic Director for Kentucky State University and later Coppin State, where he helped the university make great strides in its academic profile. In 2003, he was appointed Deputy Secretary of Commerce for the State of Kentucky. In 2015, Governor Matt Bevin appointed Derrick Secretary of Labor.